Wellington New Zealand has great coffee. 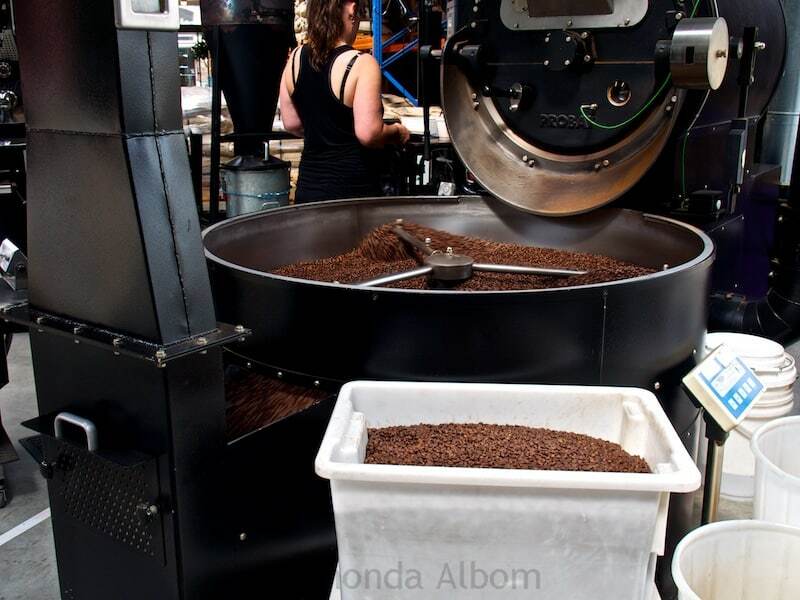 A moment inside the Mojo Wellington coffee roasting facility is all it takes to know why. Actually, we knew before we arrived. The earthy, nutty aroma that can only mean we are near a coffee roasting plant drew us in. It permeated the air with a mix of two of my favourites: coffee and chocolate, the aroma is distinctive. It called to us, and we couldn’t resist. Jeff is really into coffee and roasting. He roasts his own beans and even took a coffee training (mini barista course) last year. 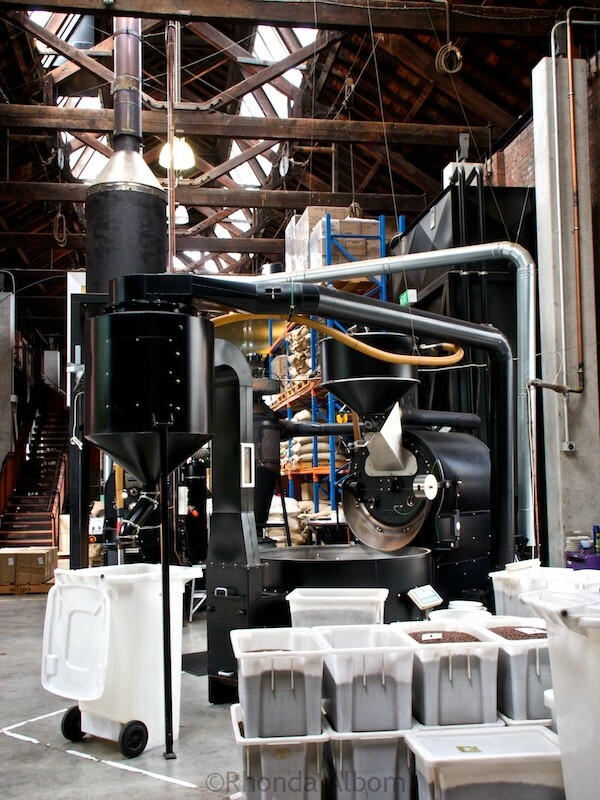 Lead by our noses, we arrived at Mojo’s huge coffee roasting facility in historic Shed 13 on Wellington’s waterfront. It’s a working factory, not an open to the public building. However, Jeff had to see how the big boys do it. We wandered inside an open door, asking permission to stay and take photos from the first person we saw. These sacks of green beans were just delivered when we arrived. We entered through the same door. We walked past these huge silos storing single origin green coffee beans. These coffee beans had already been roasted, and are now being stirred to cool them quickly. After cooling, the beans are poured into these bins to be blended later. 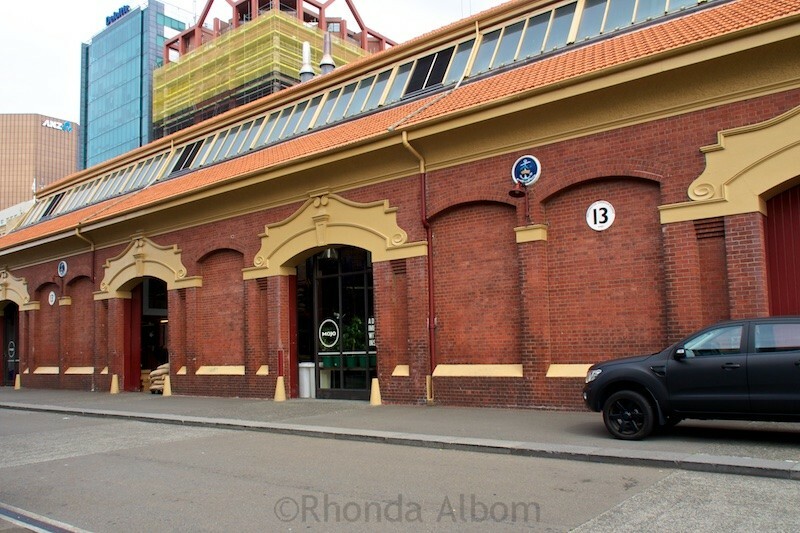 The exterior of the Wellington Mojo Coffee Roastery. Mojo does not offer public tours of this coffee roasting facility. We asked and were granted permission to enter and take these photos. 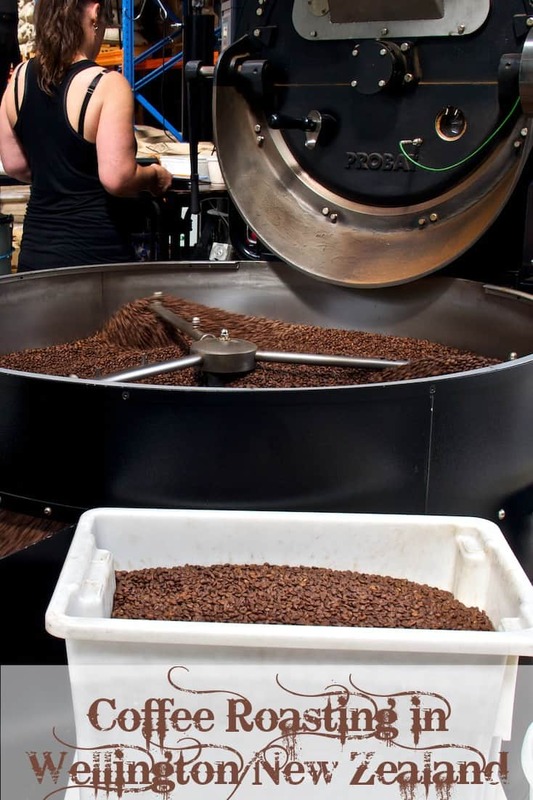 Roasted in Wellington, Mojo coffee is a New Zealand brand. Mojo has 22 cafe locations in the capital city and an additional 11 in Auckland. At the time of writing this article, they are in Japan and China and hoping to enter the US market. In addition to their own cafes, many independent Wellington restaurants serve Mojo coffee. If you are in New Zealand, you can subscribe to Mojo for home delivery. While I am generally not a fan of chains, Mojo is one brand that I will select. It is consistently rich, smooth and exactly the way I think coffee should taste. Visiting Mojo is one of many Wellington activities that keeps us busy when we visit New Zealand’s capital city. 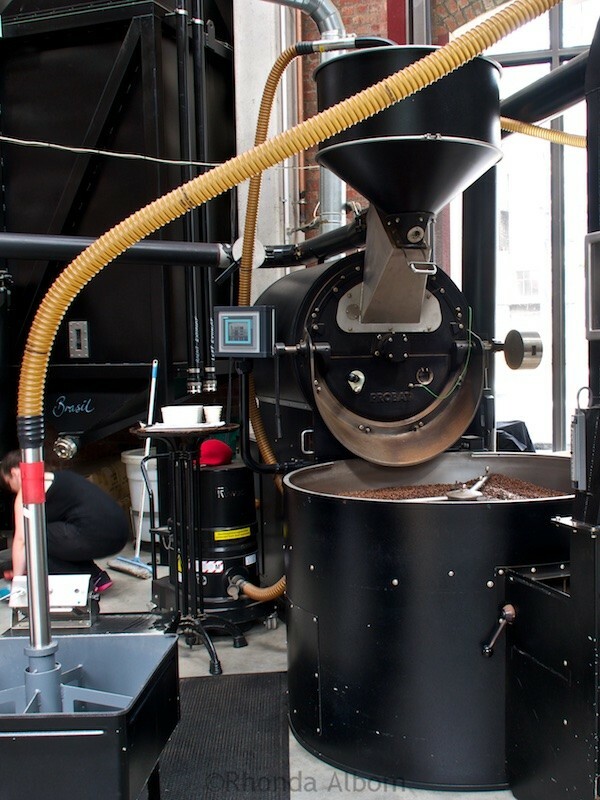 Do you do your own coffee roasting? Where do you get your favourite cup of coffee? The smell of fresh coffee is awesome! Wish I could visit this place! I am lucky. Hubby makes me a perfect latte everyday, or we go out and get one. Mojo is one on of many offering perfect coffee in New Zealand. 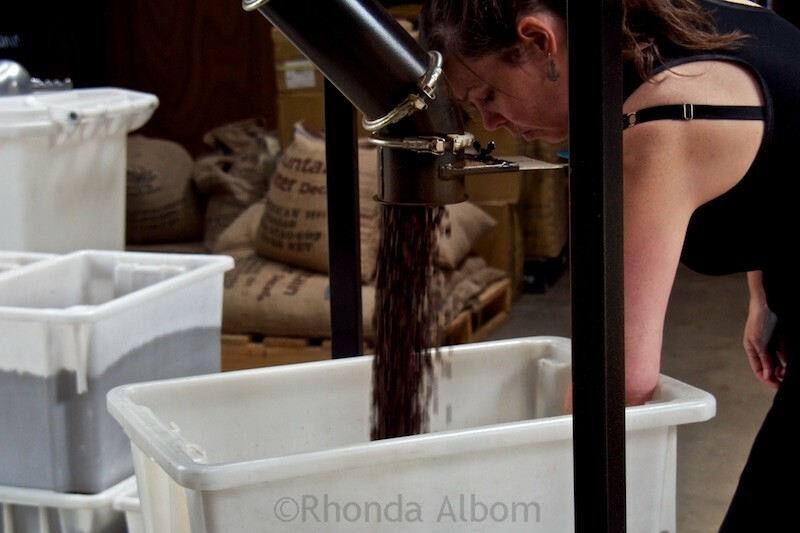 Nice share Rhonda, I also love the Aroma of coffee when it is being roasted. I haven’t beeen to a Mojo, but I once visited a remote place called Chang Mai in Thailand where they roast coffee through traditional methods. It was such a great feeling and the aroma that filled the air was just perfect. I love the aroma when roasting and you are so lucky that you have someone who is experienced and loves doing it. We may be headed to Chang Mai later in the year. Glad to know about the coffee bean roasting. I haven’t heard of Mojo before but I can just smell the coffee roasting from these photos. That is one big factory. Yes, and I didn’t capture all of this in the photos. That was so nice of Mojo to let you come in and snap some photos. I bet it smelled heavenly in there. Malaysian coffee roasting is a bit different in that they roast it with butter. Supposedly, the beans are not high quality, so the unique taste of the roasted butter masks the inferiority somewhat. How interesting. I wish I could remember the coffee from when I wan in Malaysia. Or maybe I will get a chance to go back, as now I am super curious as to what it is like. I am not crazy about coffee but I enjoy a good cup of it. Plus, I have friends who own coffee farms and have businesses revolving around the product. It is a dream of mine to visit them in Central America. I always bring about 20 pounds when I go to El Salvador. How cool would that be to visit the coffee plantation. when I was at NYU good coffee was not really a think yet. the only places that made European style coffee drinks were the Italian and French Cafes in Greenwich Village. There was also a store there that sold nothing but coffee beans that they ground while you waited. i loved walking by that store and inhaling. Freshly ground coffee really smells wonderful. I think smelling it is almost better than drinking it. I used to think that, but now I think drinking coffee is the best way to enjoy it. Hi Rhonda, I love these pictures – I can smell the coffee watching them. My daughter and I did a tour in the Domenican Republic. But it wasn’t so clean and neat. LOL – New Zealand is generally neat and tidy. Very interesting visit, Rhonda. I don’t drink coffee, but I love the smell of roasted coffee and I would have enjoyed this tour too. I visited a coffee plantation in Kona, Hawaii, and I have also seen how they were roasting it. It wasn’t a tour, we were on our own, but it smelled great! 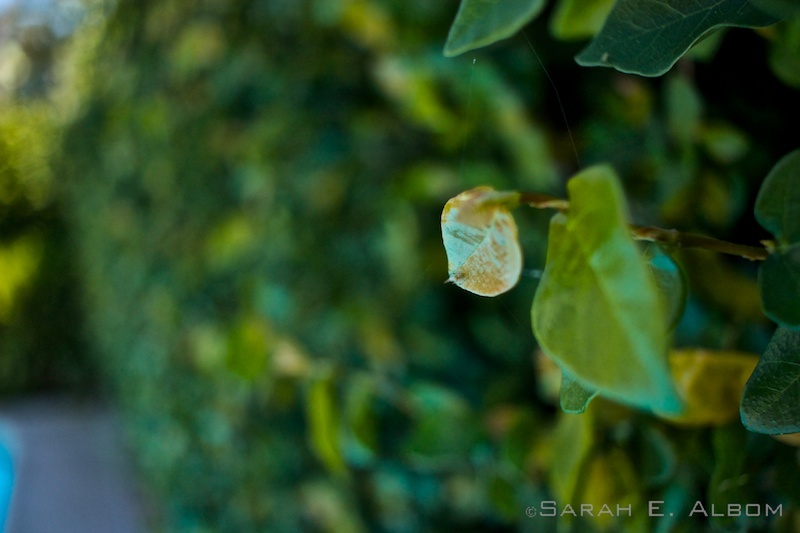 Coffee beans start out green? I had no idea. I guess I’m like those kids who think all food comes from the grocery store and farms are just where the animals live and play. LOL! LOL – yes coffee starts out green, and I like to think of farms as happy animal places too. I love coffee. I will try any type pf coffee drink at least once. Being an Italian, I enjoy strong coffee but not crazy strong coffee. I hate it when it gets so strong, it taste burnt. Yuk. I’ve never heard of Mojo. Is it only in New Zealand? I enjoyed this story Rhonda. Thanks. Yes, it is a New Zealand brand. They are looking to get into the US market. Needless to say, we drink coffee. We get our beans from the shop up the road – I’m the only person that buys their beans (they aren’t actually for sale) so I turn up and they just get them for me, so I don’t have to wait in line…it’s like a kooky drug deal, done at the side of the shop…ha! It makes me wonder what the other patrons think when you are doing this. What? Coffee training? Sign me up! I love the smell of roasting coffee and a fresh pressed ristretto. Great article Rhonda! LOL – that’s exactly what we thought when we heard about it. If you come back to New Zealand, it’s an evening event. So true. It was a good lesson for us as well. The aroma of roasting coffee is one of my favourites as well. Actually, one of the things I enjoyed most about living in Cuenca, Ecuador was walking around El Centro because the old town area had a lot of cafes that roasted their own beans so the streets were full of the wonderful smell. Did not know your hubby roasts his own coffee. That sounds so amazing. Which beans does he most prefer to use? 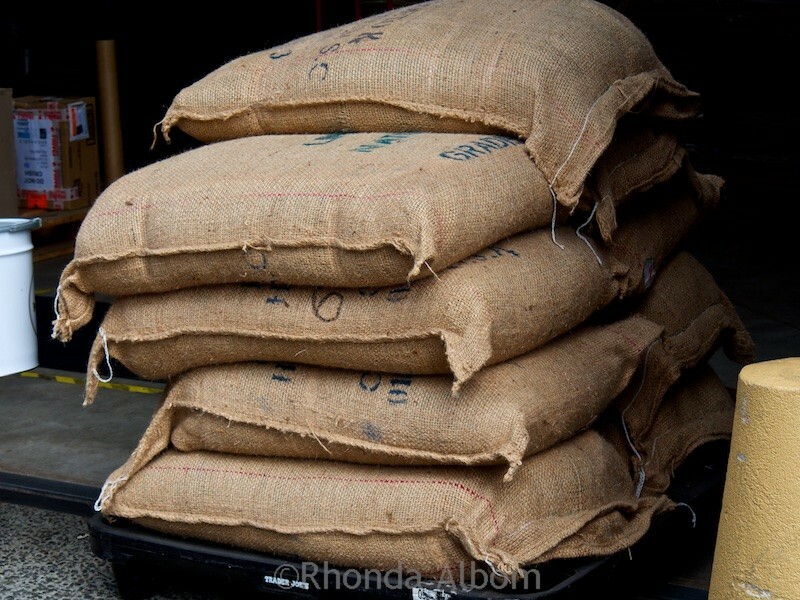 The current favorite beans come from either Papua New Guinea or East Timor. May favorite coffee is at home. I don’t care for all the flavored coffee at Starbucks so we don’t go there. Just give us a cup of dark French roast and we’re happy. I don’t do the flavours either. Be cool to see. Shame I don’t like coffee. I didn’t always like it, although I can’t remember what it was like not too. In New England, we are lucky to have lots of small coffee roasters that do a consistently fabulous job sourcing beans and roasting them to perfection. I have never thought of roasting the beans myself, but I do think I make a perfect cup of coffee. If you have found a blend of beans you enjoy, and you already make the perfect cup, there is no reason to roast your own. 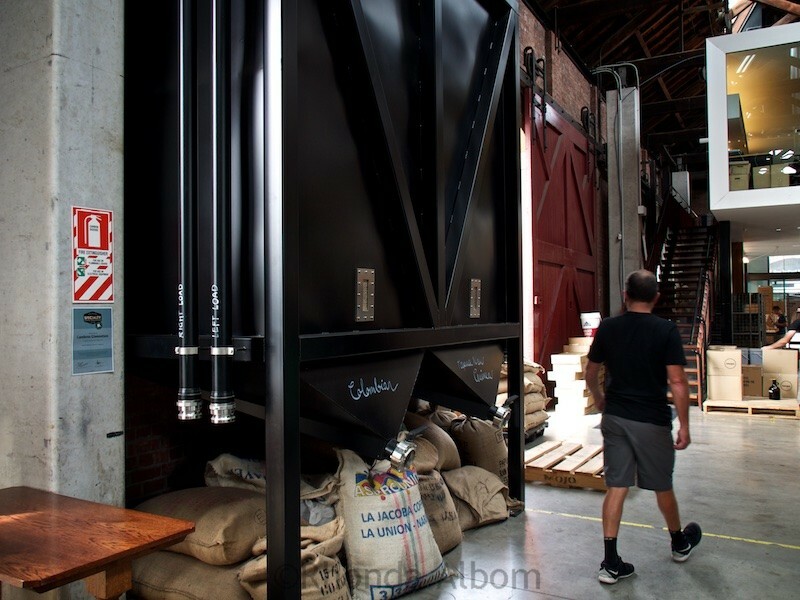 I’d love to tour a coffee factory. I bet the smell in there was wonderful. Although I love the smell of freshly brewed, as I am a coffee addict, I don’t enjoy so much the aromas of roasting coffee. Somehow the process seems bring out the bitter smell of the beans. I will agree the aroma of brewed and roasted are quite different, I do love them both. I am an unashamed coffee snob, and I am from Australia so that makes sense. I would love to have an unofficial look around also. We roast beans also, and have done barista courses. I could imagine just how good it smelt. I am a coffee snob too. At least if you ever do make it here for a visit, you know you will get a good cuppa. Hubby used to do it manually with a heat gun, then he built a small roaster that uses the same heat gun but does the spinning for him. There was a Mojo where I worked in Auckland. Good flat whites. That’s pretty cool that your hubby roasts his own beans. True dedication! Yes, Hubby is quite dedicated.